Vienna (Wien) is both the capital of and a very important winemaking region within Austria. Although best known for the white grapes Gruener Veltliner, Riesling, Weiβburgunder (Pinot Blanc), Chardonnay, several quality reds can also be found in city limits of Vienna. Vienna’s winemaking tradition is as old as the city itself first documented in 1132 and in the late Middle ages. Historically, vines were grown throughout the city, knowing now boundaries. Today, winegrowing areas are generally on the outskirts bordering the city of Krems, situated along the Danube and the Thermenregion. 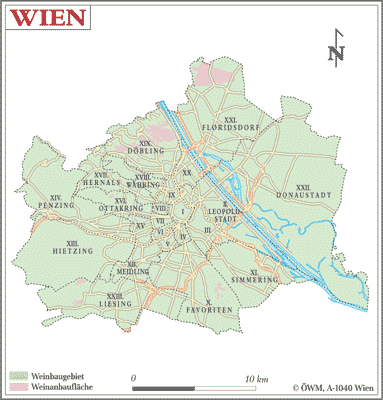 Still, Vienna remains the only metropolis with significant wine cultivation within city limits. There are over 630 wine producers and 180 Heurigen* located in Vienna to date. In the northern portion of the city, along the Danube grapes belonging to the Pinot family are prominent, but travel to the west and Chardonnay, Riesling and Weiβburgunder dominate due to the rich limestone soils. Southern Vienna is known for black, earthy soils which produce strong flavored whites and opulent red cuvees. The top growing area within Vienna is Nussberg. Located on a steep slope, Nussberg is known for extraordinary Riesling and Gruener Veltliner wines. Despite the outstanding single varietal wines coming out of Vienna, Viennese culture specializes in a unique style of wine: Gemischter Satz. Literally meaning, “mixed sentence” Gemischter Satz is a field blend of grapes grown by a particular winegrower. In these fields, multiple grape varietals are grown together with little interference from the winegrower. When the harvest begins, many times the winegrower does not know the exact grapes he/she is harvesting; therefore the blend is never the same and always a unique wine to its year. Gemischter Satz is one of the only wines of the world akin to the slow foods movement – no interference, just natural growth and cultivation of the vines. Most of the estates in Vienna are old, family estates, but are managed by young winemakers who have had the opportunity to study in winemaking techniques abroad. This accounts for an impressive balance of modern technology and traditions of old in which Viennese winemakers craft their wines. Vienna is the only city in the world that has made accessing the rest of the countries wine regions so easy; each region is just a short train ride away. *A Heurigen is a traditional Viennese food and wine bar in which the wine is stored in large vats and designed to be drunk locally within a year. This wine is best enjoyed in the moment with good company. A Heuriger first originated from wine farmers who found a way to conveniently purge remaining surplus. By hanging fir tree branches out front, they signaled that the farms were “ausg’steckt,” i.e. open for business and serving beverages to customers, who brought their own food. Heurigen are also sometimes known as Buschenschank (Heurigen are regulated by certain ordinances) which are only allowed to serve their own production and are open only few weeks in the year. The name “Heurigen” is derived from the “Heurige” wines it served, the young wines of this year (“Heuer” in Austrian), most typically Grüner Veltliner and Gemischter Satz, but now young winemakers are even using social media sites to let people know when and where they are “ausg’steckt” and sometimes they are in the middle of the vineyards overlooking Vienna – a slight change from the fir tree branches. While traditional fare at these establishments are cold cuts like ham with dark bread from a help-yourself buffet, nowadays, almost all offer warm food, if not even gourmet cuisine, and the wine selection can be extensive and sophisticated. What used to be a shack in a vineyard or a few tables by a wine press have now evolved into not to be underestimate wine estates with organic and designer wine cellars serving nouvelle cuisine Viennoise that match the food friendly high quality wines of the recent renaissance of Vienniese wine-making scene. It is no longer Grüner & Schnitzel – that’s for sure – you find Asian inspired foods with Gemischten Satz or Rieslings. These days, Viennese Heurigen are shaking off their rustic image as tourist traps in disguise and venues for day-tripping retirees. Good traditional Heurigen still exist though they are increasingly rare, while many deliberately court younger cosmopolitan Viennese who are no longer content with a sour Grüner Veltliner wine and stale dark bread. Two driving forces behind the new popularity of the Heurigen culture are the next generation of ambitious young vintners and the renaissance of the beisl (Viennese restaurant) cuisine. I am also certain that the current economic environment certainly assisted in the renaissance as well. Witness, for example, the revival of the Grinzing area, for years the ending point of tourist bus fleets or the last stop on the tourist tram, now boasting several gourmet restaurants as well as organic wine cultivation. One of the greatest charms of Heurigen is the al fresco setting, be it on a green meadow overlooking the city or in a grapevine-trellised courtyard shaded by ancient chestnut trees. As such, summer is the perfect time to visit Heurigen, when balmy evenings under the stars could only be complemented by bottomless carafes of good authentic wine. Don’t underestimate the Vienna red wines which have won several Austrian Wine Prizes in recent years and made winter visits to the Heurigen a must as well. The ultimate Viennese chill-out, if you will. In recent years, Viennese design has become increasingly associated with Viennese wine. This rather distinct alliance has bubbled to the surface in a range of ways, from glassware and bottle design to label artwork and innovative wine-cellar architecture and most importantly making Vienniese Wines a topic in Austria and abroad! Please visit their websites and view some of the pictures and menus in order to give you an impression of the current renaissance. When Rainer Christ succeeded his father as head of the winery Christ in 2004, his goal was to breathe new life into the over 400 year old farm/vineyard complex. Enlisting the help of local architects, Rainer added new features such as a wine store, an outdoor area and winter garden, whilst fine-tuning the old heurige with a modern edge – the result now showcasing Christ as a shining example of the new Viennese school of wineries. A fine example of the current renaissance of Viennese wineries and wine restaurants. And, at the moment, Hajszan also demonstrates modern Viennese cooking at its most exciting. Witness the filet of organic Nasswald beef with mustard string beans and potato-milt roulade or the braised octopus on tomato-basil marmalade with 9-year old balsamico from Pecoraro. Newbie vintner Stefan Hajszan renovated an old wine pressing house in Grinzing to include an expansive restaurant. The wine cellars and presses are now displayed behind a glass wall, and a modern fireplace stands the middle of the dining room. The staff is friendly, professional and remarkably knowledgeable. Something worth noting in traditional Grinzing which unfortunately still caters to bus tourists. This kind of sophisticated designer Heurige (wine tavern) could pose a serious threat to Vienna’s bar scene. Hans-Peter Göbel, a young architect, cultivates some of Vienna’s best reds, and these are best enjoyed in a setting as stylish as this tavern: modern with white walls, dark woods and fine lighting. It’s certainly chic enough to rival the city’s trendy bars. The Heurige’s idyllic dining garden is not to be sneered at, either. The trip out to Göbel, Vienna’s highest situated Heurige, is made especially worthwhile by the gourmet cuisine that bears absolutely no resemblance to traditional Heurige fare, what with octopus salad and marinated pumpkin with home-smoked duck breast. The chef, Franz Karner, also doubles as a renowned food stylist. Try Göbel’s award-winning Blauburger or red wine Cuvee Berg”. Vienna’s connoisseur circles eagerly await more of such ambitious establishments. Thanks for this great information, Carlo!